Rotherham appear to have accepted defeat in their summer-long pursuit of Richie Towell. 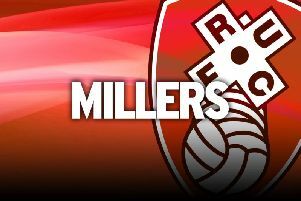 The Millers' attempt to bring the Brighton midfielder back to the AESSEAL New York Stadium has been going on since he left the group after their Wembley triumph in the League One play-off final. Wages have been just one of a number of stumbling blocks and assistant manager Richie Barker is not confident of a deal happening before next Friday's loan window shutting. He said of last season's loanee: “There is no news over the last 48 hours. Richie has been mentioned literally since the bus journey home from Wembley. “Every time we think we are getting a little bit closer something gets thrown in the way, so it is still out of our hands to a certain extent, and if something happens after Sunday we will revisit it. While there are no arrivals imminent, there has been a departure at the Millers after defender Michael Ihiekwe joined League One Accrington on loan until January. Ihiekwe has not featured this season and is at the bottom of a long list of central defenders at the club. But Barker says he still has a future in South Yorkshire. “It's League One football, fair play to Accrington for the success they had last year and they have had a good start to the season as well,” he added. “They will have looked at Michael and said he played a part of a promotion campaign in League One last year and he knows the level. Meanwhile Semi Ajayi has received his first call-up to the Nigeria squad for their Africa Nations Cup qualifier against the Seychelles next month. The defender has previously played for Nigeria Under-20s. The Millers take on Millwall on Sunday and will do so without Billy Jones due to a hip injury.